While most people consider the duo of Daryl Hall and John Oates to be an Eighties act, that’s not really accurate. For one, they remain a staple of the touring circuit today, though they’ve not produced a new album together since 1997’s Marigold. (Apparently Oates will put out his first solo record in August 2002.) They also first hit it big in the Seventies via songs like “She’s Gone”, “Rich Girl” and “Sara Smile”. Actually, their Eighties hits represented a comeback. After their initial success, they faded before they returned to the hit parade with 1980’s Voices and tracks such as “Kiss On My List” and “You Make My Dreams”. In any case, the pair’s work during the first half of the Eighties remains their most indelible achievement. Interestingly, their time as a major factor in popular music really split down the middle of the decade. They came back to the charts in 1980 and essentially left after 1985. Late 1984’s Big Bam Boom represented their real gasp as hitmakers, as singles like “Out of Touch” and “Method of Modern Love” performed well. Hall put out his second solo albums with 1986’s Three Hearts In the Happy Ending Machine and the duo never really recovered; they worked together again in 1988, but that year’s Ooh Yeah! failed to make much of an impact. 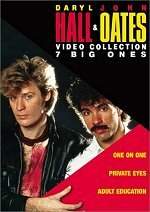 This DVD release of The Daryl Hall and John Oates Video Collection: Seven Big Ones focuses on their glory days. It ignores the Seventies and anything they did after 1983, as it covers a very isolated period. Originally released in 1984, this compilation amasses seven music videos. The set starts with two tracks from 1981’s Private Eyes: the title song and “I Can’t Go For That (No Can Do)”. 1982’s H2O provides three more tunes: “Maneater”, “Family Man”, and “One On One”. Lastly, 1983’s “greatest hits” package Rock ‘N Soul Part 1 included two new tunes, and those appear here: “Adult Education” and “Say It Isn’t So”. Not surprisingly, the oldest clips are the most basic. “Private Eyes” offers a simple lip-synch video. Hall, Oates, and their band mime the tune. The only spiciness comes from the variation of clothes they wear. Sometimes we see them in then-contemporary garb, but they spend parts of the video in “private eye” outfits with trenchcoats and fedoras. The video maintains some charm but seems enjoyable mainly due to the very good song itself. ”I Can’t Go For That (No Can Do)” provides some stylistic “flair” through its lighting. It casts a glow around the participants, but it remains quite simple otherwise. The video pares down the band to just Hall, Oates, and saxophonist Charles DeChant as they lip-synch the song. I’m not wild about the track, though it remains fairly catchy. The video’s watchable but not very interesting. Production values escalated moderately for the three H2O clips. “Family Man” goes for a conceptual affair. Shot mainly in a set that resembles a living room, it mostly shows the band as they lip-synch, but it also includes shots of kids as they pester H&O, and we also watch some shots of a family with matching pompadours. Inserted on top of this, we discern the romantic pursuits of a man and a woman who both intentionally look like characters from primitive video games. The song’s way too long - it lasts almost six minutes - and the video gets dull after a while. It had some potential due to its moderate ambition, but the clip runs out of steam well before it ends. ”Maneater” reverts to a more simple lip-synch setting. Mostly we watch the band mime the tune, but the directors intercut occasional shots of a woman who also may be a panther; the clip doesn’t make much sense beyond its clear opinion that some women are “maneaters”. The song’s still catchy and likable, and the video seems decent. ”One On One” briefly attempts a conceptual tone. At its start, we see Hall in bed as he apparently waits for the phone to ring. He then strolls the streets alone before we watch a lot of full band lip-synching at the end. The video seems a little more engaging than average, if just because at least it vaguely tries to expand beyond the normal miming, but it doesn’t do a whole lot for me. Still, it complements the song reasonably well. From here we jump to 1983 and the two new tunes created to support the greatest hits release called Rock ‘N Soul Pt. 1. “Say It Isn’t So” starts the DVD and offers a nicely bouncy and catchy tune. The video itself seems less engaging. Set in New York, it’s just another lip-synch affair, as the band mime the number on the city streets. At this point, it seems notable mostly because its last shot lingers on the World Trade Center towers. The DVD’s final track, “Adult Education”, tries to expand matters a little. For the most part, it remains another lip-synch clip, but it takes on an “Indiana Jones” tone to a degree. Set in some sort of ancient temple, we see a craggy old dude as he conducts a ceremony with two barely-clad young people while the band perform in the background. The point? I have no idea, but at least it’s a little more inventive than most of the others. As you may have noticed, there’s a certain sameness to these videos. The settings vary at times, but the style remains fairly consistent. Still, that’s to be expected of videos from this era. The format hadn’t had enough time to really evolve, so we see the genre’s formative years here. Over the pair’s 30 year history, the general public has yet to figure out what Oates does other than play guitar. Most duos have one dominant member, but in this case, the imbalance seems extreme. Perhaps to compensate for his public perception, Oates emotes to an absurd degree during these videos. Whether he tries to be angry (“Adult Education”, “Say It Isn’t So”) or funny (“Family Man”, “Private Eyes”), Oates consistently seems annoying. Back in the day, I used to like Hall and Oates quite a lot, so it was fun to revisit the old days via Seven Big Ones. None of the videos seem very inventive or creative, but the songs themselves generally are good; they continue to hold up well nearly 20 years later. Seven Big Ones doesn’t provide a scintillating set of music videos, but it seems moderately entertaining nonetheless. The Daryl Hall and John Oates Video Collection: Seven Big Ones appears in an aspect ratio of 1.33:1 on this single-sided, single-layered DVD; due to those dimensions, the image has not been enhanced for 16X9 televisions. 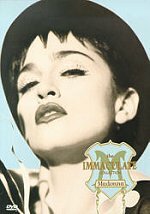 As I’ve stated during my reviews of other music video compilations like Bruce Springsteen’s Video Anthology 1978-2000 and Madonna’s Immaculate Collection, these sets can be a pain to assess because they combine materials from such a wide period of time and many different directors. Big Ones narrows that problem since all of its clips come from 1981-1983, and it provides work from only a few directors; the duo of Mick Haggerty and C.D. Taylor handles four of the seven videos, while Jay Dubin does two others. Because of this, the videos presented a higher level of consistency for the most part, but they still varied at times. Surprisingly, the two oldest clips - “Private Eyes” and “I Can’t Go For That (No Can Do)” - looked the best. “Eyes” was easily the most attractive video on the DVD. It showed a little softness at times, but it usually seemed fairly crisp and detailed, and it also demonstrated vivid colors and no problems related to video noise or artifacts. “Go For That” featured a more stylized affair, as the participants were lit in such a way to create a heavy glow around them. This limited the sharpness to a degree, but the video still appeared clear and accurate; it showed no significant issues that didn’t relate to the original photography. Matters became more problematic with the remaining videos. Strangely, the ugliest ones were the newest, the clips from 1983’s Rock ‘N Soul Pt. 1. “Say It Isn’t So” mainly took place at night, and the street setting looked weak. It showed heavy video artifacts and presented a very grainy look. Blacks appeared inky and murky, and shadow detail seemed overly thick. Colors were very flat and lifeless, and the video appeared quite soft and fuzzy. The sole contribution from director Tim Pope, ”Adult Education” fared no better. Its interior setting looked overly brown and drab, and the sharpness remained very indistinct and undefined. Many more examples of video artifacts appeared as the clip also appeared grainy and muddy. The three H2O videos were closer in quality to Rock ‘N Soul than Private Eyes, but they managed to look a little stronger than the 1983 clips. “One On One” presented the strongest image. Much of it used various forms of monochrome colors, and those came across fairly clearly and accurately. Other hues appeared somewhat messy, but they were acceptable as a whole. Sharpness was a little flat but generally seemed decent, and blacks also came across fairly well. ”Maneater” suffered from the darkness of its setting. The blacks seemed murky, and colors were bland and runny. It also seemed fairly soft and ill defined. “Family Man” presented a much brighter setting, but that just made the faded colors more obvious. The clip remained fairly soft and fuzzy as well. While I don’t think anyone put much effort into the DVD release of Big Ones, I feel that the visual problems related mainly to the original material. I’ve seen lots of videos from the Eighties, and the majority of them look pretty crummy. That’s just the way the material is, and there’s little anyone can do about that. The fact that the simplistic Private Eyes videos seemed significantly more attractive supported my belief that the source material caused the flaws with the other clips. Although many of the videos looked quite weak at times, I still thought the package deserved a “C” because the clips looked average for their era. The picture became more complicated when I evaluated the audio of Seven Big Ones. The DVD includes both a new Dolby Digital 5.1 soundtrack as well as the original PCM Stereo mixes. Across the board, the PCM sounded significantly better than the 5.1 did. The latter didn’t seem to expand the stereo soundfield much. If I listened carefully, I heard some light reinforcement of the music from the surround speakers, but the audio remained heavily oriented toward the front channels. In that domain, both tracks featured very similar stereo representation of the songs. Where they differed related to the quality of the music. Both showed some moderately excessive hiss at times, though this seemed a bit more noticeable during the PCM mix. I don’t think anyone went back to the source tapes for these songs; I’d imagine they were mastered from the old video production, not from the audio masters. Some tape hiss seems likely from even the highest generation tapes of this era, but this set showed too much of that problem, which led me to believe the tracks came from later reproductions. I also heard a little hum at times. Despite those flaws, the PCM track generally sounded quite good. Highs came across as clear and bright, while bass response seemed tight and deep when appropriate. A few of the songs lacked great low-end - the Private Eyes songs appeared especially thin in that regard - but this issue related to the original production. Really, the PCM versions sounded pretty good except for the hiss and source flaws. Unfortunately, the 5.1 track didn’t provide good representations of the music. The audio appeared very cold and sterile. Highs sounded thin and flat, while bass response seemed nearly non-existent. During low-end heavy songs like “Maneater”, some moderate thump appeared, but the track remained fairly lifeless most of the time. The 5.1 versions sounded considerably more restricted and thin compared to the PCM tracks, and that mix didn’t merit anything above a “C-“. The PCM edition lost points due to the excessive hiss and noise, but it still sounded good enough to deserve a “B-“. Seven Big Ones provides no extras at all. Considering the DVD’s low list price of $14.99, this doesn’t surprise me, but it seems somewhat disappointing nonetheless since so much additional Hall and Oates material exists. The limited nature of Seven Big Ones causes my greatest complaint about the package. The DVD provides some songs that remain bouncy and solid after two decades; Hall and Oates aren’t high on my list of faves, but I enjoy some of their music, and the disc includes a few of their better songs. The videos themselves seem basic and simple, but that results from the ambitions of the era. The DVD’s quality largely represents the styles of that period as well. The clips usually don’t look very good, but not many music videos from the early Eighties seem attractive, so I can’t fault the transfer; it appears to represent the original material. The new 5.1 mix sounds weak, but the PCM stereo comes across acceptably well. It’s the fact that Seven Big Ones doesn’t expand upon the original 1984 videotape release that creates the greatest problems. Why not produce a more expansive collection of Hall and Oates videos? There isn’t a wealth of material out there, and rights questions may interfere, but we certainly could have gotten a few extra videos and perhaps some interview segments as well. Better still, the inclusion of a 1985 Hall and Oates concert at the Apollo would have been good. It was previously released on video and would have made this a nice “double feature” set. Again, I have no idea if Image tried to accomplish some of these goals but couldn’t due to rights issues. Nonetheless, the restricted nature of Seven Big Ones means it will enjoy very limited appeal. 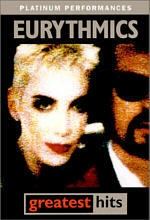 Unlike the extensive Eurythmics Greatest Hits, it includes far too few tracks to constitute a real “best of” package, though it does provide some fine songs. Die-hard Hall and Oates fans will want to pick up this bargain-priced collection, but I doubt it’ll hold much interest for many others.